Alter The Press! 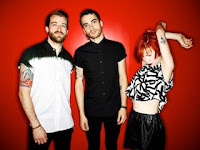 : Paramore Achieve Highest Billboard Hot 100 Rank with "Ain’t It Fun"
Paramore Achieve Highest Billboard Hot 100 Rank with "Ain’t It Fun"
Paramore achieved their highest Billboard Hot 100 rank this week with their latest single "Ain't It Fun" (26-21). Dates and ticket information for the band's upcoming summer co-headlining tour with Fall Out Boy can be found here. "Almost seven years after it first appeared on the chart, the band achieves its highest Hot 100 rank with "Ain't It Fun" (26-21), powered by a 24-14 blast on Radio Songs (51 million impressions, up 21 percent, according to Nielsen BDS). "The Only Exception" (2010) and "Fun" predecessor single "Still Into You" (2013) each reached No. 24 on the Hot 100. Lead singer Hayley Williams had an idea "Fun" would be a hit: "You're gonna hear this a lot on the radio next year. Get used to it," she warned before performing at Z100's Jingle Ball in December."